Noel: I’m sort of glad we watched the 1974 pilot after Season 1 but before Season 2. 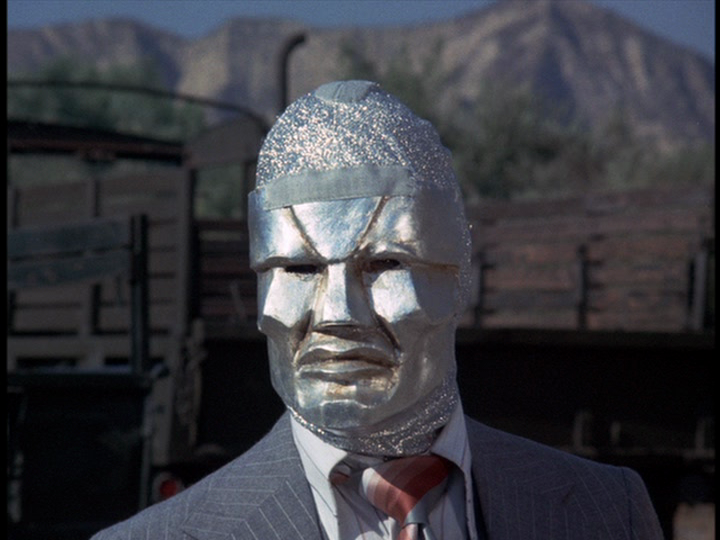 While this new season feels very much like a rehashing of the Lynda Carter pilot movie in a lot of ways — including some sequences that more or less have been reconfigured from that movie for this one — it also has elements that I imagine would’ve eventually infiltrated the Cathy Lee Crosby series, including a fencing robot and a talking computer. How did this brand new show (of sorts), but continuation of the first season, play for for you? Kerensa: I agree. The Paradise Island sequence for me really felt like we had seen most of it before. But overall, I really enjoyed this episode! I mean that my Queen Lucille Bluth was prominent in it totally helped. But I really liked the change in Diana since she’s done this before. And Steve Jr. seems like less of a tool than his father. Noel: We did end up with a second pilot, essentially, but given the time skip and the network changeover (the show moved from ABC to CBS), I think another origin story was just a shade necessary. What fascinated me the most, though, was that it was essentially a reboot! WE’VE BEEN REBOOTING SUPERHEROES AND THEIR FRANCHISES SINCE THE 1970s (technically, we’ve been doing it longer than that in the comics, but you get my point)! So any time someone wants to complain about rebooting, we can now say, “Meh. They’ve been dong this forever.” They should still stop, probably, but it’s hardly a new thing. Of course in all this re-piloting, some things were lost, namely the show’s minor political bent. In the 1940s, it was harder to have her espouse a feminist message and have it feel justified (even though it is a fantasy, and who cares? ), but now that we’re very much in the ’70s and all that that could entail, I was bit surprised at how quiet it was on that front, apart from Gloria and Diana’s apartment-wrecking fight, and the former’s notion that women are always enemies. And, hey, at least faux-Steve learned that no means no, dammit. It’d be nice if Wonder Woman showed up every time some sleaze failed to compute that. Kerensa: Yeah, but the 70s I think could potentially be really interesting if the minor political bent of the show comes back. But do you think it was just quiet in this episode? I agree that there wasn’t much to that except for the scene that you mentioned but I can’t really imagine us watching a Wonder Woman that is completely void of politics (minus that terrible movie but I’m already erasing that one). Yeah, faux-Steve totally doesn’t bother me! And he likes older women. Because all we should probably be talking about is Lucille Bluth’s previous job. 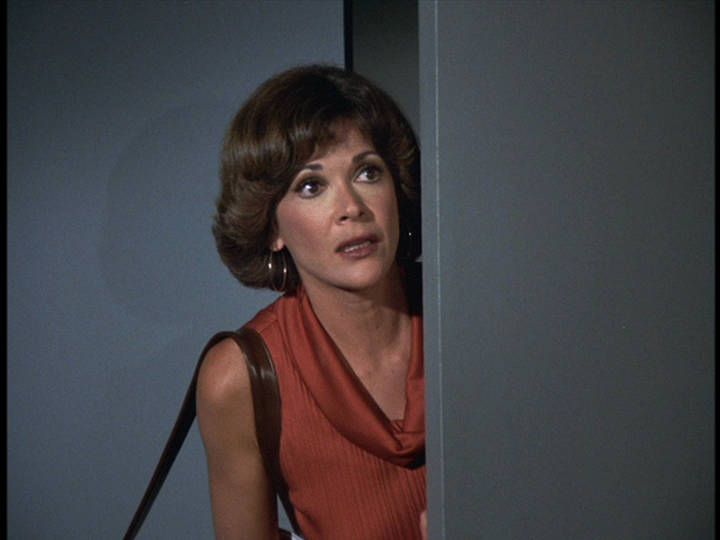 What did you think (other than being brutally hot) about Jessica Walter on this? Jessica Walter was brutally hot. It took me a while to recognize her, but profile-wise and line delivery sometimes, it was totally her. And she had a good character in Gloria, one who wasn’t just around Solano for the eye-candy, but had some talents and skills of her own, including mad research skills. I would’ve liked more interaction between her and Wonder Woman, but what did you think about her ways of attempting to diminish Diana by always getting her name wrong? And tell me what you thought about the fencing robot! WITH AN ATOMIC BOMB FOR A HEART. Kerensa: Oh yes! HIM. But I kinda like calling Steve Jr. faux-Steve. SO HOT. I would have loved more interaction between her and Wonder Woman as well. I thought that it was funny and kinda reminded me of something Lucille Bluth would pull with all of her children. Or really anyone. UM the fencing robot was ridiculous. SO RIDICULOUS. What did you think? Also, interested on your thoughts about faux-Steve (Jr.) and Wonder Woman’s talk about his dad and everything she tells him? Noel: Fencing robot was ridiculous, and I…worry…? it’s what we have to look forward to now that the show is taking place in the 1970s. Certainly it frees them up from dealing with Nazis all the time (except, you know, that next week’s episode is actually about Nazis…), but it also allows the show to become a bit more silly, and I’m not sure I necessarily need or want more silly than what we had in Season 1. But between the fencing robot and the chatty computer A.I., I’m not too optimistic about where this could be going. I get that they’re aiming for family-friendly, and nothing says family-friendly more than fencing robots, but I’m not sure how receptive I’ll be to this overall. I’m sort of holding back an opinion on Steve, Jr. and Wonder Woman. I liked that bonding moment a lot, and I’d love for their relationship to be more platonic, less UST-y than WWII-Steve had with her, so we’ll see how that goes. I do think it’d be creepy if they started something together just because of, you know, her and Steve and all. Family-friendly might just save us from that! Kerensa: So basically you are worried that all of the elements in the hokier episodes of the first season will dominate this one? I’m going to remain optimistic for once (weird!) and say I’m gonna hold out hope. I feel like there’s a lot of interesting things that the show could do with the time shift and I’m hoping it utilizes it. Should we make a bet on this? Also, the chatty computer, A.I. is the worst. I liked that bonding moment a lot too. And I agree wanting their relationship to be platonic–I think it would be much more interesting plus she seems like maybe she’ll confide in Steve Jr. more already? Other thoughts? I mean I have some thoughts re: fashions. Noel: The show is pretty 70s-tastic, re: clothes and decor, but let’s hear your thoughts. I know Emma will be thrilled that Diana’s ginormous glasses survived the transition. My big question was whether or not we’re supposed to see this new Diana Prince (and Steve, Sr. never mentioned his super-capable secretary to his son?!) as the dowdy, mousy woman who wouldn’t turn heads? I don’t think we’re supposed to since it’s not outright stated. Kerensa: I’m not surprised that Steve Sr. never mentioned Diana to his son because he was too busy lusting after Wonder Woman to like actually pay attention to her skills I’m sure. 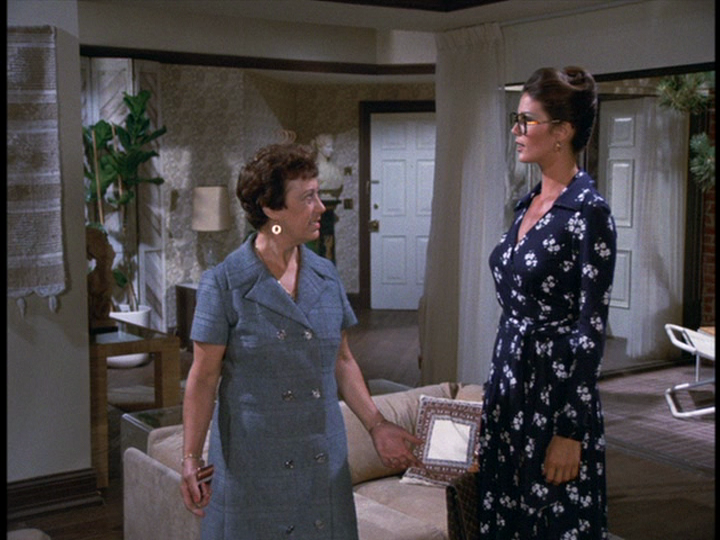 I’m loving the clothing—basically everything Diana and Lucille Bluth were wearing I was all about. Diana’s (obviously Diane Von Furstenberg) wrap dresses were all so amazing. And I’m pretty sure I spied a Louis Vuitton bag in there too. (In case you couldn’t tell I’ve seriously studied fashion magazines since I was 10) And her new apartment! SO AMAZING. Totally digging the 70s aesthetics here. I don’t think we are supposed to see her like that at all. Even if we are, how could you? Look at her! Other thoughts on the episode? Noel: One thing I did respond to was the political aspect of Solano’s plan, and the notion of South America as a fulcrum of power in the globe. I’d be interested to see how much of this global approach carries through. Will we get Wonder Woman dealing with Soviets? Oil tycoons? What/Who do we replace the Nazis with? Kerensa: Yes that’s totally true. And something to think about. Do you think it will focus on one greater evil (ala season one) or almost take on a more procedural spin? Noel: I’m betting a more procedural thread, heavy on the potential blend of spying and superhero-ing. Just a hunch. More complicated political environment than just “Evil Nazis.” You? Kerensa: That’s what I’m kinda thinking too especially because if there was a larger narrative thread, I think we would have got some hint of it in this episode and there wasn’t really anything. Interesting that WONDER WOMAN had to leave ABC to become more like THE SIX MILLION DOLLAR MAN, which I think was a definite influence on the new direction. Still, if it gives us fencing robots, I’m all for it (though I should disclose I’m a sucker for stupid-looking robots). For a Kandel script, it wasn’t way out enough, though time had to be spent reestablishing the characters, concept, and relationships. Yeah, a lotta deja vu in the Paradise Island scenes, but probably necessary. Alan Crosland wasn’t a great director (really, most of the really good TV directors during this period had graduated to longform television and left episodic gigs behind), and he really blew a few shots, including an important one where we see Diana’s toss of the robot barely made it past the cave entrance instead of deep inside where it was supposed to go. 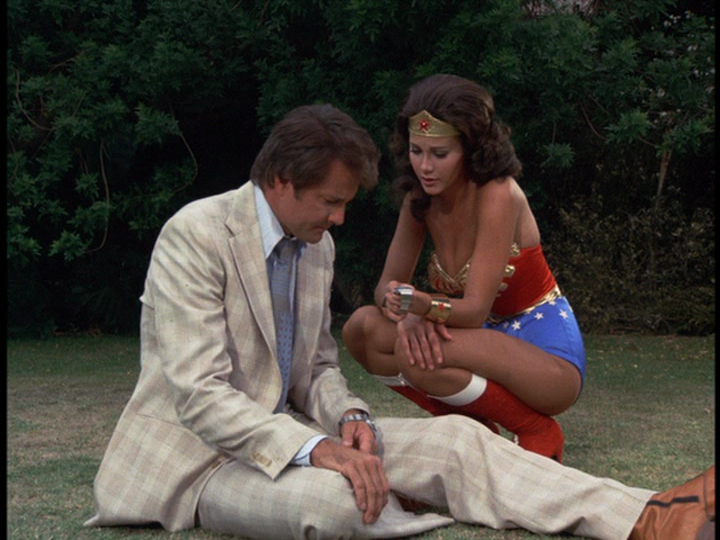 The episode’s only major misstep was Diana’s lack of response to the news of Steve Trevor Sr.’s death. When Bettye Ackerman delivered the news of “the late Steve Trevor,” it should have had an emotional effect on Diana. I understand CBS probably wanted to downplay the original WWII concept, but it rang false to me that a sensitive soul like Diana wouldn’t react to Steve’s passing. I don’t know whether this was Kandel’s fault, but I giggled when Trevor said, “In this century alone, so-and-so-many planes have been lost in the Devil’s Triangle.” In what other centuries would airplanes have been lost? ?